As a voice teacher, I can tell you one of the most common goals new students have is to learn to breathe correctly for singing. Often times, students will ask for breathing exercises and they think that I am going to make them hold their breath or give them a workout. But I don’t do this often in voice lessons. While learning to breathe correctly when you sing is important, it’s not the ONE SECRET to singing success. This myth has been around for centuries! That’s because a lot of voice teachers out there that spend a crazy amount of time and energy teaching students to breathe. And this leads singers to believe that breathing is the ONE BIG SECRET to singing well. There’s no question that breath control is an important part of singing better, but it’s not the be-all and end-all. So if breathing isn’t the big key to singing better, why do I talk about it? The truth is that learning to breathe for singing is actually one of the easiest ways to improve your singing voice. And without correct breath, it’s easy for the rest of your singing to suffer. By the way, if you want a vocal program that will take you through all these singing techniques, you can check out my complete singing course, Master Your Voice. So today, let’s talk about how to breathe correctly when you sing and then I’ll give you 3 tricks to increase your breath control like crazy! Next, we have the phonation system which is the vocal cords (vocal folds) coming together in your throat to resist air. The resulting vibrations from that resistance produces sound and creates the raw material for the voice. Using the fuel analogy from the respiration system, phonation is like the motor that’s converting the breath from the lungs and diaphragm into energy. Finally, we have the resonation system which is the way the vibrations and frequencies produced by the vocal folds vibrating interact with the cavities around them. The mouth, pharynx, nose and nasal cavity are examples of resonating chambers. To use the fuel analogy, this would be the carburetor in the car ensuring the best use of this energy. The breath is only one small part of the whole system that makes up a great singer! And in my honest opinion, it’s also the easiest to master. For example, if you strain a lot as you sing higher, adding more breath to the equation isn’t going to fix that. With that said, there are a few important things you learn about breathing for singing. These things are especially important if you want to hit higher notes. So here are the most important exercises to ensure that your breath is supported. As simple as this sounds, posture is an incredibly important component to breathing while singing, especially if you’ve been having problems with losing your breath in the middle of a phrase. So let’s do it right! 1. Stand in front of a full length mirror and turn so you can see the full length of your body from the side. 2. Now, stand so that your head is even above your shoulders, not jutting forward or pulled back. 3. Then make sure that your shoulders are comfortably positioned at your sides. 4. Using your shoulders as a guide, ensure your hips are evenly spaced and in line with your shoulders. 5. Finally, using your hips and shoulders as a guide, stand so that your feet are evenly spaced and in line with your hips. If this feels uncomfortable or new, double check your position in the mirror and make sure that you didn’t miss any steps. Now, that you’ve found the tall posture we can move on to the fun part of engaging the right muscles for breathing. In this section, you’ll learn to breathe from the diaphragm correctly. All breathing involves the diaphragm. I don’t care whether you’re breathing from your shoulders or the back of your ears, the diaphragm is still involved. So let’s talk a little about how the diaphragm works when you sing. The diaphragm is an upside-down bowl shaped muscle that separates the chest from the abdomen. It’s connected to the bottom of the lungs and is the main muscle you use when you breathe. 1. When you inhale, the diaphragm contracts from it’s normal upside-down bowl shape into an almost flat muscle. 2. Since the diaphragm is connected to the lungs, it naturally pulls the lungs open as it contracts. 3. Nature hates a vacuum, so with the lungs open, air rushes in and we get the feeling of breathing in. Now that you know how we breathe from the diaphragm, let’s talk about the end goal of breathing from the diaphragm. For every vocal technique, there’s a new way to learn to breathe for singing. The diaphragmatic breath is the most efficient one for singing. Singing from the diaphragm means that you’re breathing by moving the diaphragm, rather than involving the chest, shoulders or hips. Most people engage lots of extra muscles in their body that aren’t designed for breathing. A student psyches themselves up to hit a high note and they take the biggest breath they can, raising their shoulders and chest. But that just adds tension to your throat! So if you feel like you’re running out of breath in the middle of singing, odds are you can improve your breath control dramatically. Now that you understand how the diaphragm is supposed to work when we breathe, here’s how you use it in your singing. 2. Make sure that you’re standing with tall posture like we discussed in the last section. 3. 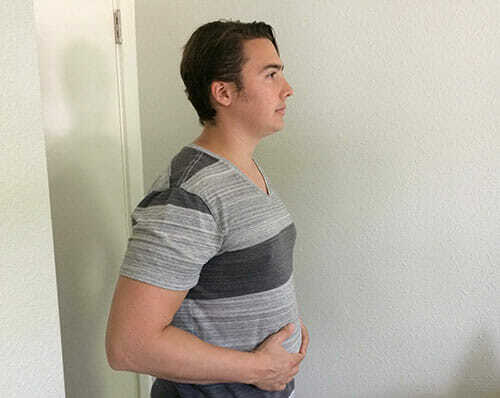 Place both of your hands around the bottom of your belly (like if you were pregnant and you were feeling the baby in your stomach). 4. With your hands in this position, breathe in so that your belly moves outward. 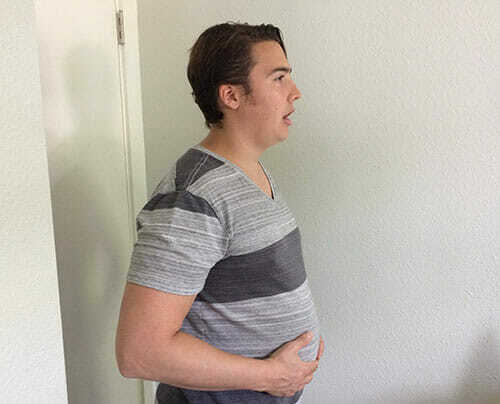 We want the belly to extend and push the hands out as you inhale. Try to do this without raising your shoulders or chest. The idea is to keep all the movement in your body isolated to your stomach extending outwards. 5. Now, breathe out and allow your stomach to come back in. Your hands should follow your tummy as you breathe out. As you practice moving your breath to the much stronger diaphragmatic breathing, you’ll see that you’re able to take much larger breaths with a lot less effort. If you get lost, repeat the steps again. Make sure that your stomach is expanding or moving out on the inhale, and contracting on the exhale. Many singers make the mistake of sucking in their stomach as their breathe in. We’re actually trying for the opposite. If you catch yourself doing any of these things, that’s a sign that you’re doing something wrong. This would be clavicular or costal breathing, rather than abdominal or diaphragmatic. To fix it, simply reset your posture and try to move your breath to the abdomen. Now that you’re breathing from the diaphragm, here’s one daily exercise to increase your breath control. With the posture and diaphragmatic breathing in place, I’d like to show you my favorite breathing exercise for singing. So if you’d like to grow your breathing capacity for a long phrase or sustain in a song, follow this exercise and repeat it daily. This exercise was made famous by the castrato singer Farinelli. Farinelli was famed for his ability to sustain notes an incredible amount of time. I like to use these breathing exercises for singing warm ups. 1. Grab a metronome or look at a clock with a second hand. Here’s a free metronome if you need one. Set your metronome to 60 beats per minute (the clock is already counting at this speed). 2. Gently inhale through your mouth for 4 counts making sure that you’re inhaling from the diaphragm. Remember, when you breathe in from the diaphragm, your stomach will expand. Also make sure that your chest and shoulders aren’t rising as you inhale. 3. Now, hold the breath in the diaphragm for 4 counts. You don’t want to bear down on the breath here, just gently hold it as if you could keep inhaling or exhaling at any second. 4. Finally, exhale the breath for 4 counts allowing the stomach to come back in as you exhale. 5. Repeat this cycle immediately after the exhale, but this time inhale for 5 counts. Continue these cycles, increasing the count each time until you feel any discomfort. A good rule of thumb is to work up from 4 counts to 7 counts the first time you try it. That means 7 count inhale, 7 count hold and 7 count exhale. First, you will have to very gradually control your inhales and exhales as the counts get higher. This is fantastic practice for your breath support. Second, take note of the feeling of “sustaining” the breath. You want the feeling between “sustaining” the breath and singing to be the same! Singing should feel like a natural extension of the “holding” feeling you’re getting. This small amount of pressure creates a strong tone, but it shouldn’t feel like a huge rush of air escaping like you feel when you exhale. In reality, we sing on the exhale. But the feeling of “holding” the diaphragmatic breath is much closer to the feeling of sustaining a long note. How Do You Put This To Use in Your Voice? By now that you’ve learned to keep a tall posture, how to breathe from the diaphragm and use the Farinelli exercise. Learning to breathe for singing is just one part of improving your voice. Just because you’re singing with tall posture and can do a 10-count Farinelli exercise doesn’t mean that you’ll be able to hit high notes without falsetto. Or fix your vocal break. That’s because breath support is just one of many systems that make up singing. There’s a lot going on when you sing. So as you continue working on your voice, it’s important that you start singing in head voice, adding vibrato, or even singing in whistle register. Learning to breathe correctly for singing is the best place to start. That’s because if you have breath support, you have a solid foundation for singing well across your vocal range. A lot singing exercises are helping your body become more efficient at breathing and singing from the diaphragm. So practice them often and you’ll notice how automatic proper breath support becomes. Once that’s accomplished, you can move on to the bigger stuff. If you’d like a complete vocal program that will teach you to sing from the ground up, consider picking up my course Master Your Voice or book a lesson.